← The Shirts are Here! This encounter appeared in the Delta Discovery in 2013. It happened sometime during the 1930s. It’s a story of a group of hunters who sought shelter in an old house and had a hostile visitor during the night. Let’s take a look. others, decided to go hunting on the west side of Nunivak Island (Lincoln, 2013). Nunivak Island is the second largest island in the Bering Sea and a tad north and a bit west of Kuskokwim Bay. (Go to N60°00’00’ and W166°33’00’ and you would just about be in the center of the island.) Nunivak Island is part of the Yukon Delta National Wildlife Refuge and is separated from the rest of Alaska by the Etolin Strait. The trio were hunting and traveling by dog team. Nunivak Island is the home to “musk oxen and reindeer” (Lincoln, 2013) but we don’t know for sure what the men were looking for. After a day’s travel, they decided it was time to quit for the day. They sought shelter in an old and abandoned sod house that was located at an old fish camp (Lincoln, 2013). There is really nothing unusual about doing this sort of thing. Winter temperatures can be life threatening and using existing shelters makes things just that much more bearable. Sod houses in use at fishing camps and hunting camps are usually small and have small entrances (Lincoln, 2013). Old Sod House chosen as representation of area architecture. Photo by Betty Bodfish, citation below. The men tended their dogs and their gear and then settled into the sod house. The Northern Lights were more than likely dancing across the sky and the men had eaten their dinner. They were tired after the many miles they had come and were ready for sleep. Then it happened… The dogs outside began to grow restless. Something was approaching the sod house where the men were bedded down. The dogs began to bark. The barking grew louder and louder and it was not a friendly or happy kind of bark. The dogs were afraid. Their shrieks and howls alerted the men and they were probably growing very concerned about what was going on beyond the door to their sod house. Suddenly “someone or something” was pounding on the door (Lincoln, 2013). Whatever it was, it knew the men were in the sod house and it intended to come in. Was it curious? I doubt it. Trying to rip the door from the house is not something a curious creature does. It wasn’t reported, but I can imagine this thing heaving itself against the door as it howled in agonizing protest at the men. The men had to be gripped in fear at this point but they still had enough sense left about them that they grabbed their hunting rifles and prepared to shoot whatever it was if it succeeded in tearing down the door. Then it was over as quickly as it had begun. If the door would have been a living thing, it would have sighed in relief. Whatever it was, it was just too big to get in and it gave up the attack (Lincoln, 2013). The dogs stopped their fearful barking and settled down. The trio went to the door and slowly peered out not knowing what they were going to see. As their eyes probably became accustomed to the inky cloak of the darkness beyond the sod house they saw …”a tall, silvery-colored creature walking upright” in the distance (Lincoln, 2013). The creature grew smaller with each step and eventually disappeared as it walked behind a nearby hill. There you have it. As with the other men mentioned in previous chapters, I consider the men lucky. Things could have turned very ugly in a matter of a few heartbeats if the Nunivak Island Beast had been able to gain entry to the sod house. Is the “silvery-color” the creature’s true color or did it appear that way in the Arctic moonlight as it departed the scene of the assault? Does “silver” colored hair indicate age as it would in humans? Were there areas of other colored hair on its body indicating that it was a true Marked Hominid? Were the dogs harmed? Other reports of Boreal Sasquatch indicate that they can hardly stand dogs and will kill them if given the chance. A sled dog tied to a stake for the night would have been easy enough to dispatch. What did the trio possibly do that triggered the assault? Was this a result of “trespassing” in some unknown territory? 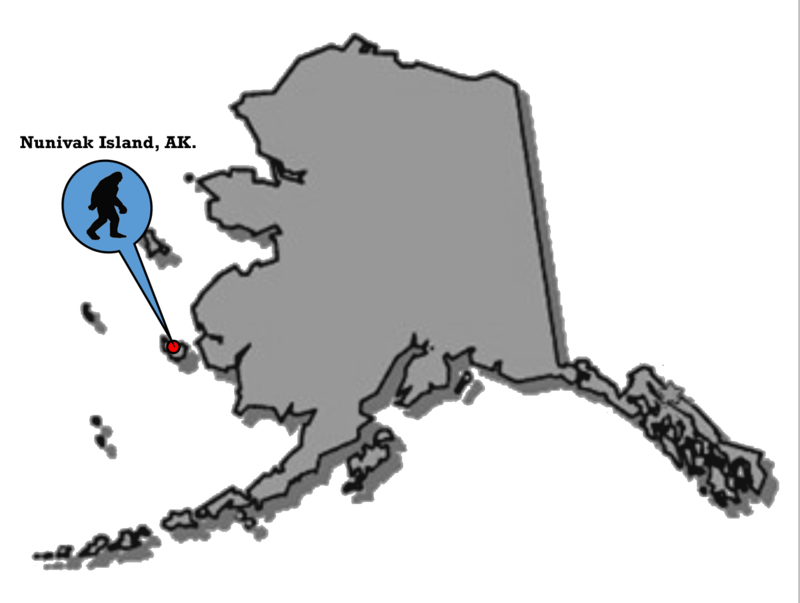 Did the Nunivak Island Beast feel threatened or was it protecting others? Of course, we will probably never know the answers and considering that this encounter took place at least 75 to 80 years ago, it’s doubtful that we ever know exactly what occurred that fateful night. However, descendants of the Nunivak Island Beast still roam the area. Like all of the other wild men we have learned about, reports of tracks being discovered and occasional sightings continue to trickle in to Sasquatch Tracker. Lincoln, K. 2013. Nunivak Island Bigfoot in The Delta Discovery, Online: June 19, 2013. , Online: http://www.deltadiscovery.com/story/2013/06/19/hairy-man/nunivak-island-bigfoot/1276.html (Accessed: 23MAR206). Bodfish, B. N.D. Old Sod House Built by our Ancestors. 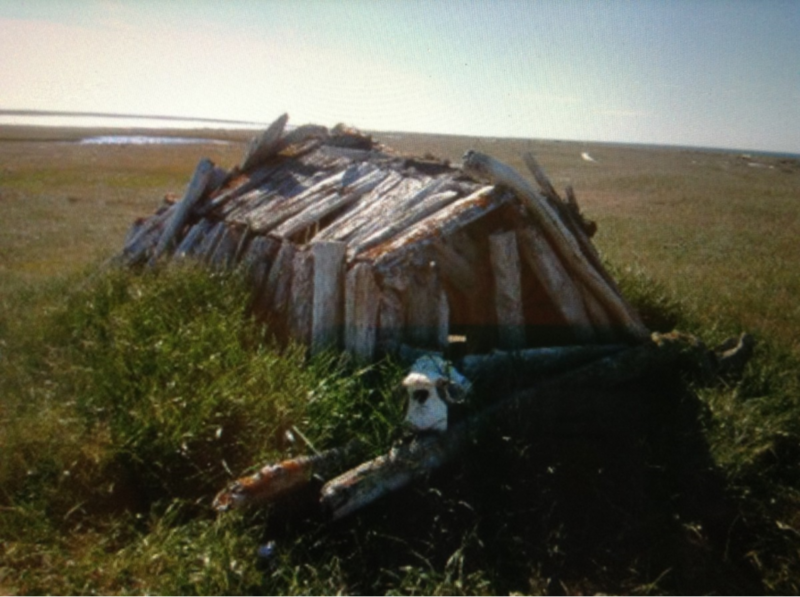 Online: http://www.alaska.org/photo-contest/anchorage-airport/entry-betty-bodfish-wainwright-alaska-old-sod-house-made-by-our-ancestors (Accessed 24Mar2016). This entry was posted in 2016, Historical, Other Behavior and tagged Boreal Sasquatch, Historical, Other Behavior. Bookmark the permalink. Thanks Michael, another great story!